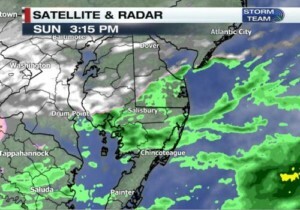 This past weekend Delmarva experienced its 1st winter storm of 2019, which brought snow, rain, sleet and wind. This also was the 1st storm of the season to bring accumulating snowfall for all of Delmarva. Location played a huge role on what type of elements were felt. The winter storm was a massive system that at one point advisories, watches and warnings extended from the Eastern Shore to Colorado. 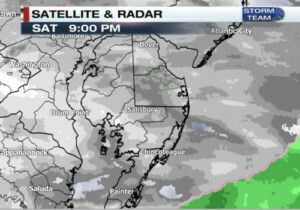 Snow was the main precipitation type as the storm began on Delmarva on Saturday night. The snow was light before midnight before picking up intensity overnight. 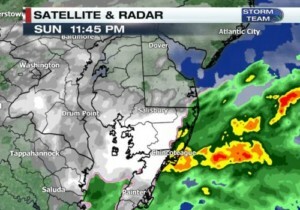 The rain and snow line was beginning to march north over the peninsula after midnight as well; as a coastal low moved northeast along the Carolina coast. The rain/snow line kept its northern march until Sunday afternoon before receding south after nightfall. 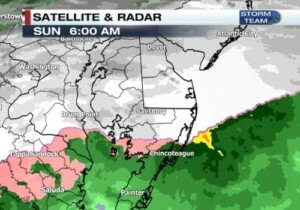 The wraparound moisture of the storm brought back the snow for all of Delmarva on Sunday night and early Monday, with southern Delmarva taking the hardest hit in the storm’s final stretch. 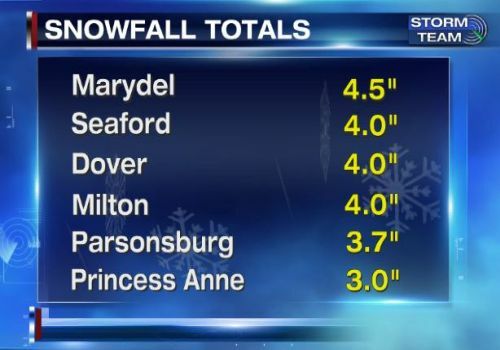 Southern Delmarva experienced the least amount of snowfall with accumulations reaching less than 3 inches in the early going. Chincoteague reported 2.5 inches of snow before the rain arrived before dawn on Sunday. 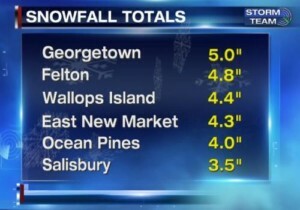 Wallops Island recorded new daily snowfall records on Saturday and Sunday with 1.5″ and 1.7″ respectively. 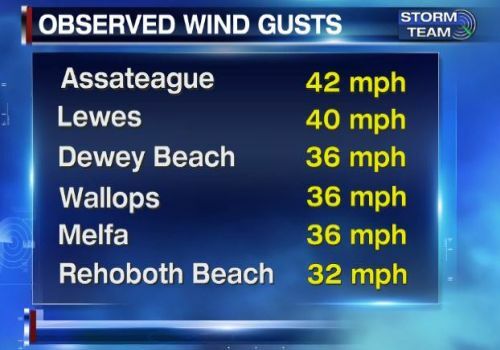 This area also experienced the strongest winds gusts, with Assateague gusting up to 42 mph, while Melfa and Wallops within Accomack County achieving gusts of 36 mph. Since the rain arrived fairly early in Accomack County and stuck around all day, Melfa and Wallops observed the heaviest rainfall totals of at least three-quarters of an inch. Even though all the snow from Saturday night, nearly dissipated with the rain; a heavy burst of snow arrived Sunday night into early Monday from the wraparound moisture. This second batch of snow was able to even out totals all over Delmarva with 4.4″ in Wallops and 5.3″ in Parksley. Central Delmarva had the most diverse weather on the peninsula, as the snow intensified Saturday night into early Sunday morning. Salisbury Airport received 3.5 inches of snow by Sunday morning, but the 1st changeover started early at 6 AM in the form of sleet before becoming all rain by 10 AM. The rain/snow line extended far north into Sussex County which included Georgetown by the afternoon. Along the rain/snow line, periods of freezing rain occurred, especially in Dorchester County. The strongest inland wind gust was achieved in Salisbury at 29 mph; meanwhile Lewes had the 2nd strongest wind gust of the storm at 40 mph. Ocean City was the rainiest spot along US 50 with accumulations of half an inch. Snowfall totals in this region were heaviest over Dorchester County where temperatures were at freezing almost all day; while eastern locations like Millsboro accumulated 5.0″ with most of their accumulations taking place in the wraparound snow on Sunday night and early Monday. 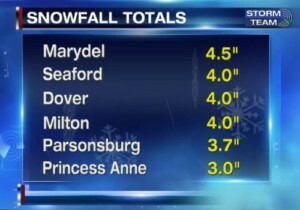 A pure snow event took place over northern Delmarva, as temperatures all day remained at or below freezing. 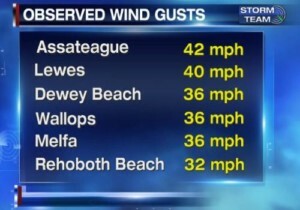 This area of Delmarva had the lightest winds with gusts only up to 25 mph. The bit of wind experienced up here though kept conditions quite uncomfortable, as wind chills got down into the upper 10s to low 20s. 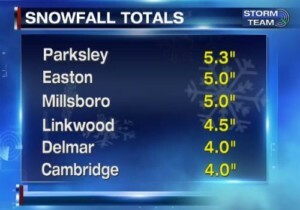 Snowfall totals in this region were fairly uniformed with 5.0″ recorded in Easton, 4.8″ in Felton and 4.5″ in Marydel. The wraparound moisture at the end of the storm had a minimal effect on the totals, as the snow tapered off before midnight. The concern for Monday night is that any daytime melting will freeze over; as temperatures tumble down into the upper 10s to lower 20s. The good news is that temperatures will warm gradually throughout the workweek melting away the weekend snow. Unfortunately a new storm system is in the forecast for this weekend which is projected to start as a rain on Saturday, followed by falling temperatures and a possible wintry mix on Sunday. Stay tuned with our Storm Team for the latest winter weather information.